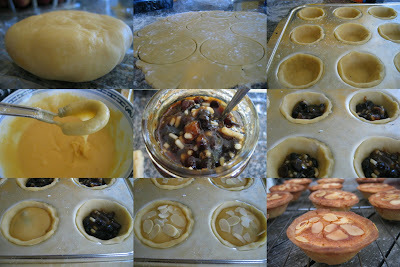 As promised, a quick post on the mince pies we had with our goose dinner. (You also may be wondering what I'm doing blogging on Christmas day - presents are done, and dinner is not for a few good hours. Now it's sweet, sweet sofa time). I seriously love mince pies, but have been restrained about my mince pie consumption this year. Rather than buying boxes and boxes of pies, and making massive batches of my own, as I usually do, this year I only made a half-batch of Nigella's frangipane mince pies, (my favourite mince pie recipe from my How to Eat project). In How to Eat, Nigella provides a brief guideline, but a full recipe appears in How to be a Domestic Goddess. These consist of almond pastry, a small spoon of fruit mince, topped with almond frangipane and flaked almonds. A half batch of these babies makes 12 mince pies - making a larger number would simply be irresponsible in my house - and in such small quantities, the pastry is easy enough to make by hand, rather than in the processor. (I'd still recommend freezing the butter cubes and flour/almond meal/sugar first, as Nigella suggests). They only take about 10 minutes to bake, and have a lovely, delicate almond flavour. Gorgeous! They look Gorgeous as well. I've wanted to make these ever since I bought 'The Domestic Goddess. You have inspired me. Perhaps next Christmas. All the best, Corry.